The news was shocking! 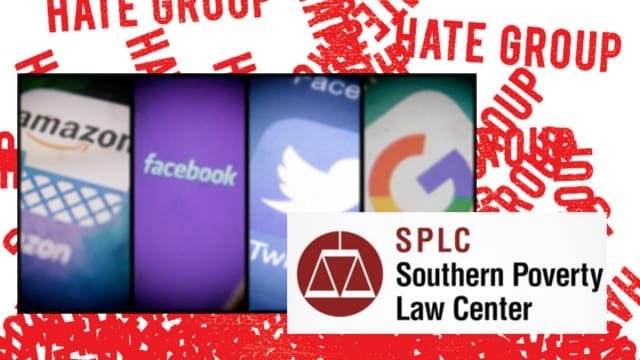 On Thursday, June 7, it was revealed that Facebook, Twitter, Amazon, and Google – four of the most prominent tech companies in the world – had allied themselves with one of the nastiest, most vicious, hate-mongering organizations in America – the Southern Poverty Law Center (SPLC). The announcement has raised alarming questions about where this nation is headed. Arising from the civil rights movement in the 1950s and 1960s, the SPLC was founded in 1971 as a small civil rights law firm, whose mission was to champion the rights of black Americans in the south who were still excluded from, in its own words, “good jobs, decent housing, public office, a quality education, and a range of other opportunities.“ It was a noble cause, indeed. But over time, the mission of the SPLC changed. Its website still promises the scope of its mission to “fight hate and extremism, protect children at risk; support LGBT rights, fight for immigrant and economic justice, and teach tolerance”. But in its effort to rid the country of hatred and intolerance, the SPLC has become one of the least tolerant organizations in the nation, one that generates and exports hate to the uninformed, the innocent, and the gullible. Instead of providing a model for Americans to follow, the organization has appointed itself to be judge and jury of whatever it believes constitutes hate, and who in America they deem to be a hater, to be vilified and destroyed. The SPLC has made hate a consumer product. Its support for Muslim causes and its campaign against ‘Islamophobes’ has made it a natural partner for the Council on American Islamic Relations (CAIR) and the host of Islamic organizations nationwide that are linked to it. Nine years ago, CAIR was designated an unindicted co-conspirator on charges of providing material support to Hamas, a designated foreign terrorist organization, and a co-founder of CAIR. Despite that, CAIR has maintained a high degree of credibility. Through a combination of excellent public relations and a high degree of secrecy about its internal operations, CAIR continues to be considered the leading advocate for Muslims in America. The partnership between CAIR and the SPLC makes sense. In the mean time, the SPLC’s massive fundraising campaign has filled its coffers to overflowing with cold, hard cash. In its 2016 IRS 990 filing, it showed revenues of $136, 373,624 and nearly half a billion dollars in assets to underwrite its activities, making it among the richest not-for-profits in the country. The choice of ‘haters’ that the SPLC targets is related less to reality than to politics. It brands those whose beliefs are different from its own with a list of derogatory names like ‘extremist’, ‘anti-LGBT’, and ‘Islamophobe’, among others. It works tirelessly to limit the freedom of expression of any individual or group that does not embrace its own radical ideology. Its determination of who is a ‘hater’ is dependent largely on whether a group or individual is liberal or conservative. In fact, the SPLC represents the most radical liberal/progressive ideology in the country. It denigrates conservative groups and religious organizations supporting traditional values as ‘hate groups’ and lumps them all together with real hate groups, such as the Ku Klux Klan, Aryan Nation, and Nation of Islam, calling them all by one name: ‘Hate Groups’. The SPLC boasts that it has identified 917 such ‘hate groups’ in America, including the Center for Security Policy and the Center for Immigration Policy, while liberal/progressive organizations, such as Black Lives Matter, BDS, and Antifa, who are continually engaged in flagrant anti-white and anti-Semitic politics, not to mention street violence, are omitted from the list of hate groups and are not labeled haters. Individuals who have devoted their lives to promoting and educating Americans on the issues that threaten our national values and the freedoms guaranteed to us by the Constitution, are tarred with hate brush, and some have been destroyed by the devastating attacks. The SPLC engages in open attempts to destroy their reputations and their livelihoods, while challenging their right to freedom of expression guaranteed by the First Amendment. Even conventions sponsored by conservative groups are targets for SPLC’s spite. The Western Conservative Summit (WCS), for example, which is held every spring in Denver and is billed as “the largest gathering of conservatives outside of Washington, D.C”, is also a target. SPLC describes its list of speakers as “both veteran rhetorical hardliners and members of the new generation of far-right social media propagandists.” It goes on to say, “The WCS has been a forum for anti-LGBT, anti-Muslim and anti-immigrant oratory in the past, and this year looks to be no different”. The list includes such dignitaries as Attorney General Jeff Sessions, Iowa Congressman Steve King, Frank Gaffney, Brent Bozell, Dana Loesh, Charlie Hurt, Diamond and Silk, and many more. In other words, in the eyes of the SPLC, if you are a conservative, you are a hater. At the same time, real hate-mongers such as Black Lives Matter and Antifa, and individuals like Linda Sarsour, a leader of the new women’s movement who nonetheless supports FGM (female genital mutilation), and Siraj Wahaj, imam of Brooklyn’s Al Taqwa Mosque, who daily spew anti-white and anti-Semitic lies in public forums across the U.S., are not only given a pass, they are lionized as heroes and are not to be found anywhere on the SPLC’s hate list. Yet patriots like Lt. General William “Jerry” Boykin (ret), and Frank Gaffney, Executive Director of the Center for Security Policy, have both been linked by the SPLC with the leader of the Nation of Islam, Louis Farrakhan, and white supremacist David Duke, on the same SPLC list of extremists. Lt. General Boykin was Undersecretary of Defense for Intelligence under President George W. Bush, and spent 13 years in Delta Force. He was involved in a number of high profile missions including the rescue of hostages from our Iranian Embassy in 1980 and the black hawk down mission in Mogadishu, Somalia. These men are heroes, not haters. And they are just two of many. So what are Amazon, Google, Twitter, and Facebook doing with the SPLC? Well, we know something about Amazon’s connection and it’s not pretty. According to Peter Hasson of the Daily Caller, “Jeff Bezos’ company grants the SPLC broad policing power over the Amazon Smile charitable program, while claiming to remain unbiased.”This is a program that allows customers to donate a percentage of proceeds to various charities. The Daily Caller reported that it is SPLC who determines which charities receive the donation. In a May article, the Daily Caller reported that a well-known Christian legal group was not allowed to donate to the Smile program, while other openly anti-Semitic groups were able to participate. The news that these four tech giants have combined their powerful influence and resources behind the SPLC is not only disheartening; it represents a serious threat to our national identity and to the very freedoms that Americans cherish most. It also hurtles us into a greater political divide than this nation has seen since the Civil War. In the name of liberal political interests, such powerhouses as these four mammoth tech companies have aligned themselves with an organization whose stock in trade is hate. Not only are they heaping upon the SPLC a heavy new layer of credibility, they are hurting many good people who love this country and work every day to make it better. The fact that they disagree on the means and methods to make America better should be food for thought and discussion, not demonization and the further spreading of hate. These mega techs should reconsider with whom they align themselves. Their message to their customers, their employees, and their investors should be anything but hate.